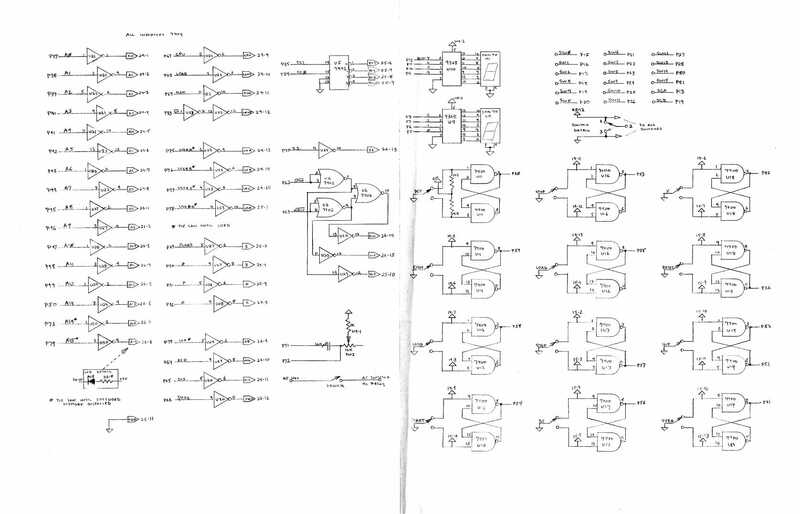 I unearthed the original schematics of the homebrew computer I built long, long ago… an 8008-based machine that resides in the Computer History Museum (that link will open in a new window and show you four professionally done, zoomable photos). Before sending these six 11×17 hand-drawn documents to be with the machine, I scanned them for this archive. 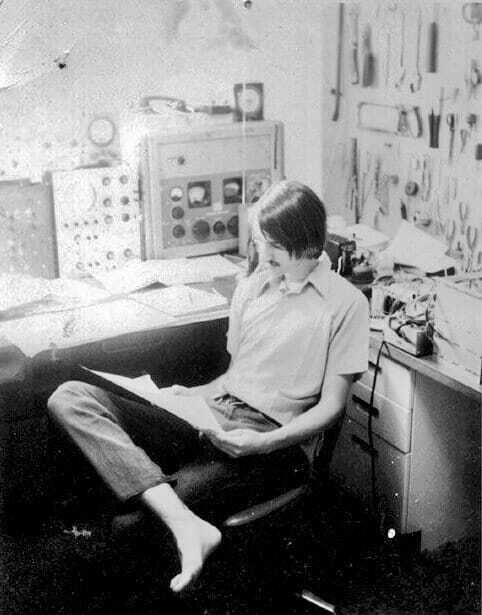 The system predated those newfangled S-100 Altairs and IMSAIs that kicked off the personal computer phenomenon, flickering to life on October 31, 1974 after six months of obsessive design and fabrication with only the cryptic Intel 8008 databook for reference. In some primal male response to those first blinkies, I started my beard that day. 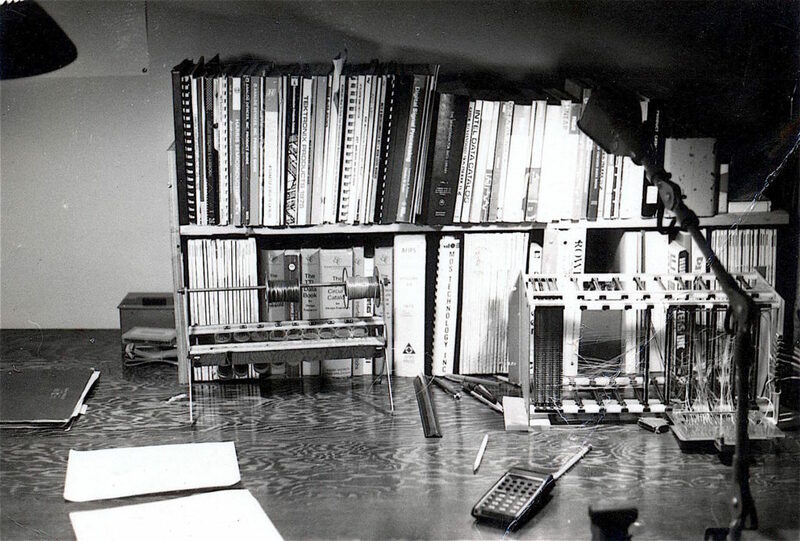 Building the machine in 1974 – Scanbe RapidRack card cage, dispenser of precut and bulk #30 Kynar, data books, HP-35 calculator… treasured relics. 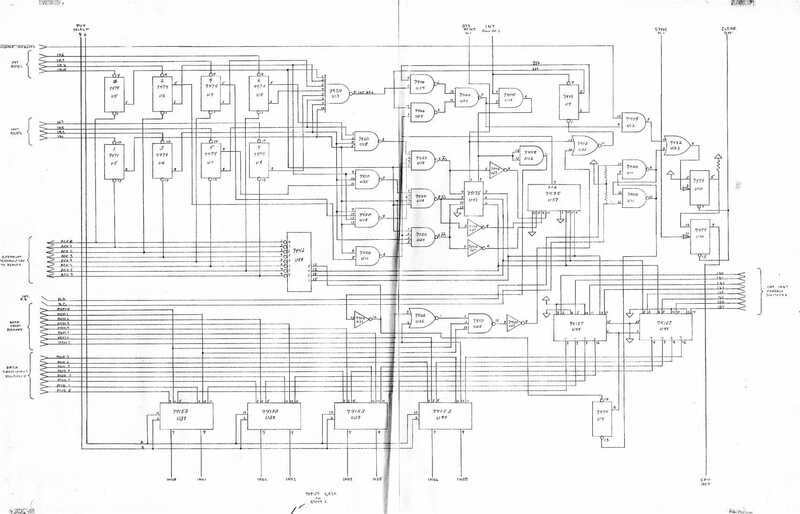 Microprocessors were bizarre back then, and at first I considered the project just a break from the ALU-based mini I was designing (but never finished). More than with any system since, I dove very deeply into this, feeling the bits between my toes. 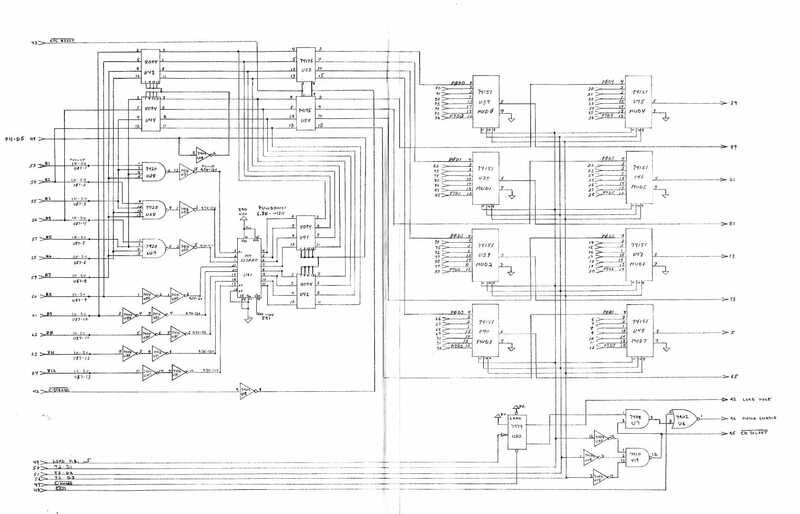 I still shudder at the 4-phase 600 kHz clock and the odd things that took place during transition boundaries… like the magical fleeting appearance of the content of a register if you tried to move it to itself (“load B with B” and the like). 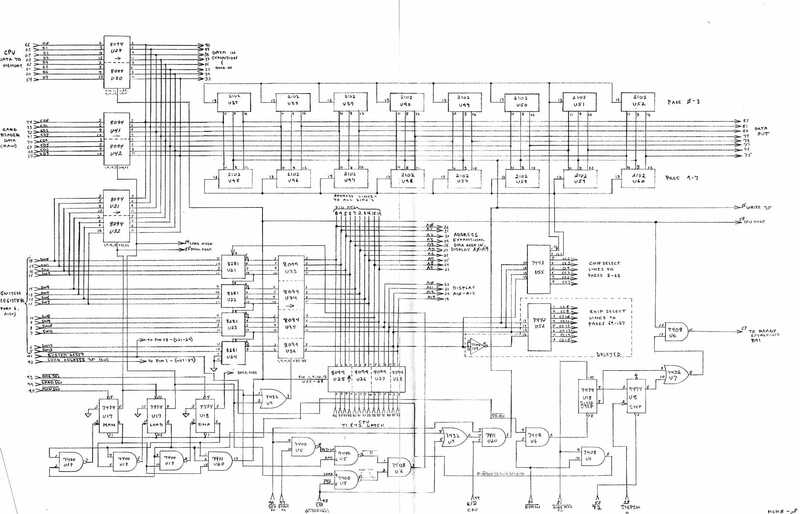 This sort of thing enabled a number of outboard enhancements that let me overcome the 8008′s intrinsic shortcomings… in particular, a hardware hack that added a data stack in outboard TTL RAM in addition to the limited 7-level return stack in main memory, allowing me to save context on a subroutine call. The machine had 4K of 8-bit static RAM made of 2102s… I originally dedicated a wirewrap board to a mere 2K, but wanted MORE… MORE! 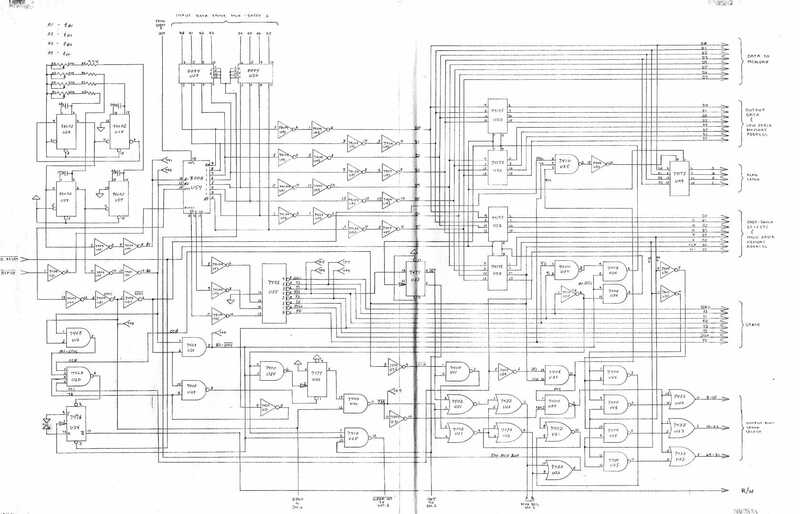 So one night, I folded out all the chip-select leads of another 16 expensive 1024-bit DIPs, then soldered them on top of the first batch and wired the floating selects back to the address decoder. Wowzers! A whopping 4K. I was ready to compute the world. 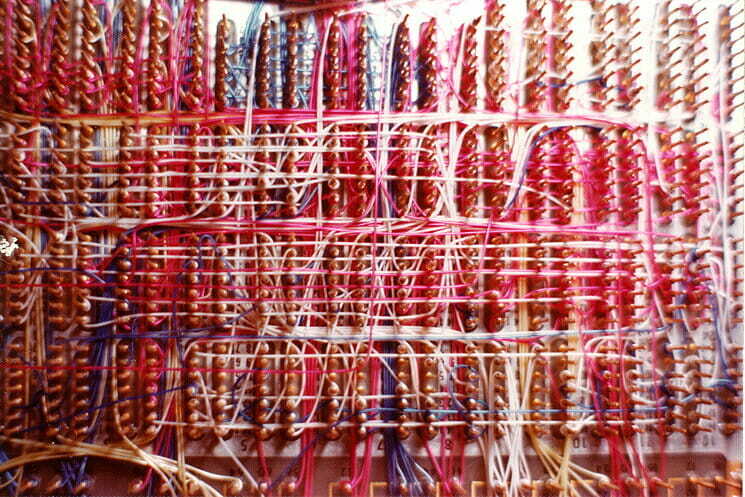 Part of the CPU board… I used 60-socket Augat panels and a venerable Gardner-Denver 14XA2 wirewrap gun. 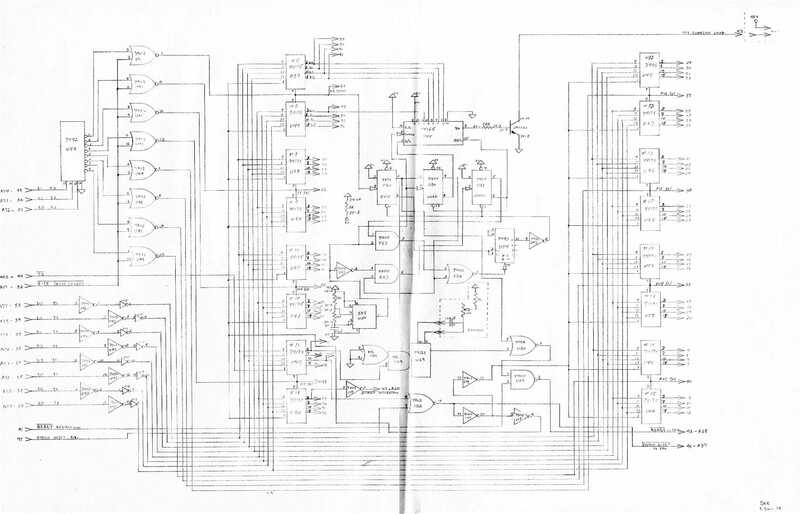 There were 8 interrupt channels, 64 bits each of input and output, a graphics subsystem using a pair of 8-bit multiplying DACs outputting X-Y to my Tek 7504 oscilloscope from a DMA display list, and a painfully slow math co-processor made from a Taylor-Series calculator chip with kluged BCD and 7-segment interface (mostly because I was intimidated by writing floating-point routines). I remember the night it drew a lovely (sin X)/X curve… took HOURS and I had consumed half a bottle of Jack Daniels by the time it was done, but it was a thing of beauty, I tellya what. I sure do miss front panels. 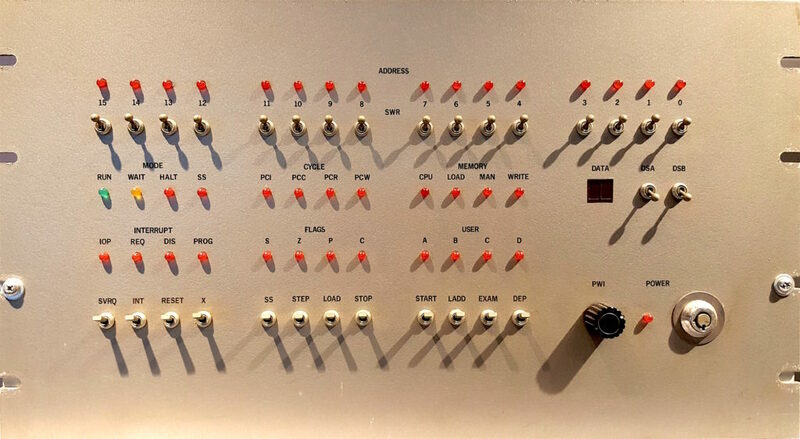 This one got a lot of use, and my early “screen saver” was a 555 (associated with the black knob) that allowed variable-speed single-stepping and a corresponding hypnotic blinking of the address and data bus LEDs. 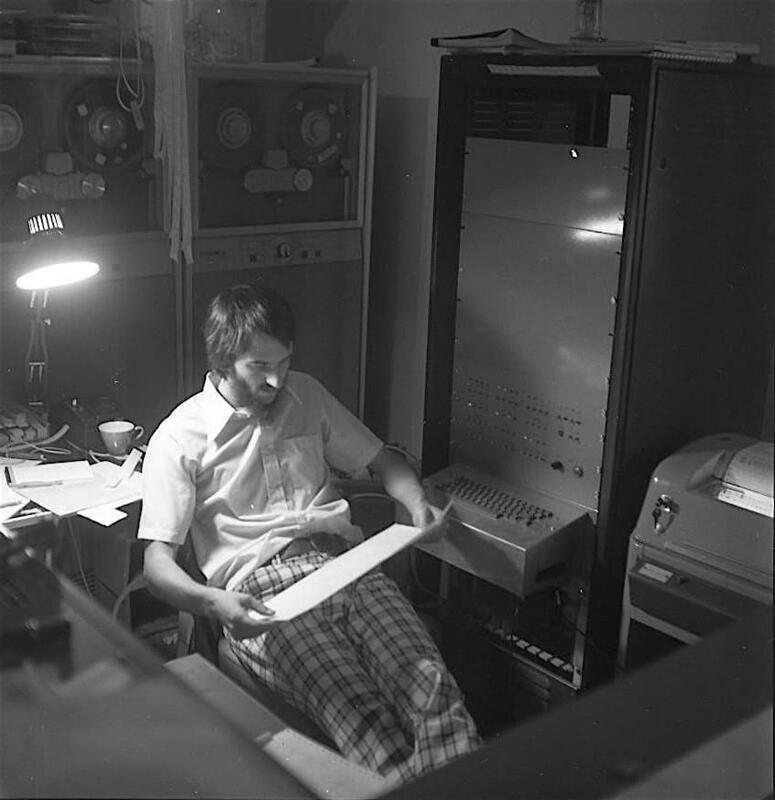 I remember one debugging night when address bit 14 appeared to be always on. I popped off the wire at the driver chip (a 7404) and it was still on, so obviously there was a short to ground between there and the LED pin (the other side went to a pullup to +5). So I casually removed the wire. Here’s a delightful profile in a local magazine, back in 1976… and in 1975 I published a card-dealing subroutine for the 8008. 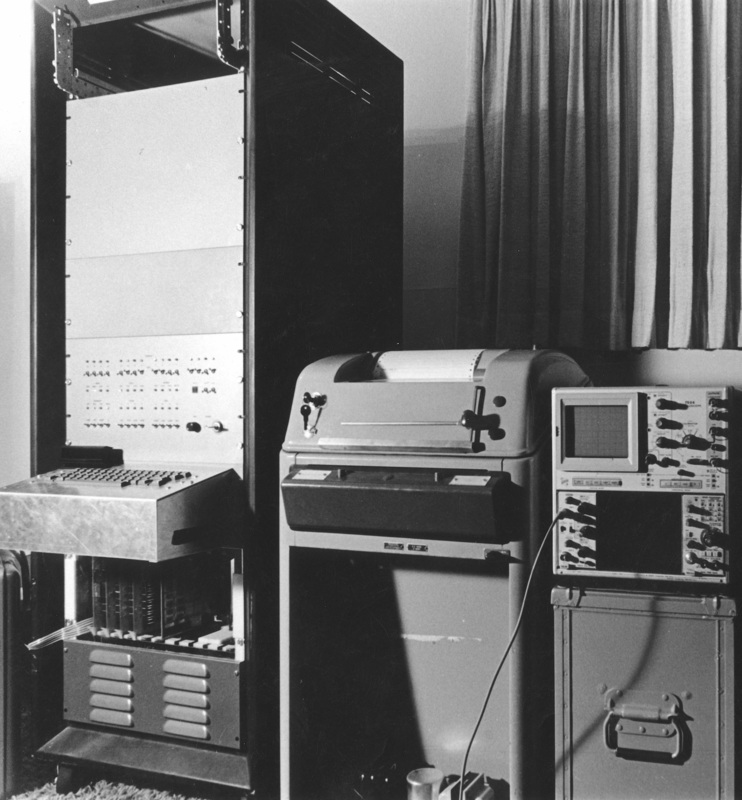 I acquired a trio of Univac Series 70 tape stations, but other than firing them up occasionally to enjoy the hypnotic vacuum-columns during tape transport, never actually interfaced them with the machine. 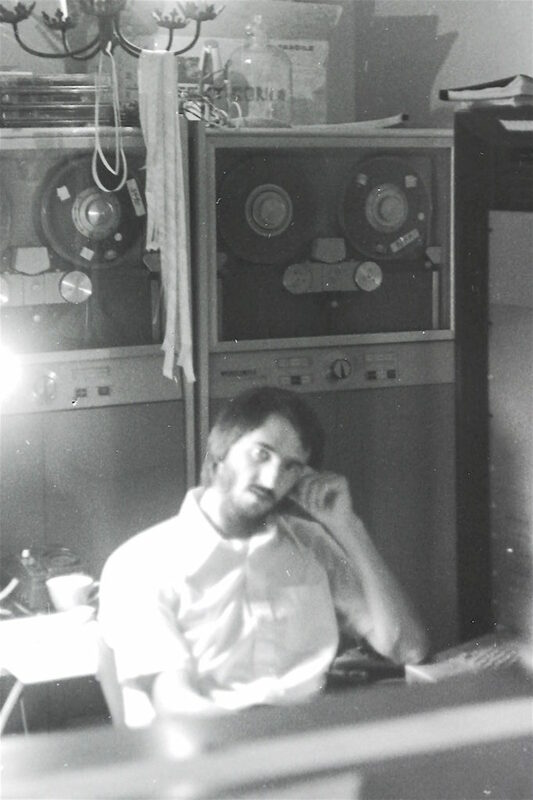 In this photo, my elbow is on the 8008 system keyboard, and you can see an acoustic coupler behind my right shoulder. I didn’t make any effort to write text documentation to go with these, since, you know, the design was intuitively obvious to the casual observer. For the moment, I’ll just title the pages; perhaps some lazy evening at anchor, warmed by the wood stove, I’ll go back and try to recall what some of the more obscure random logic was doing. 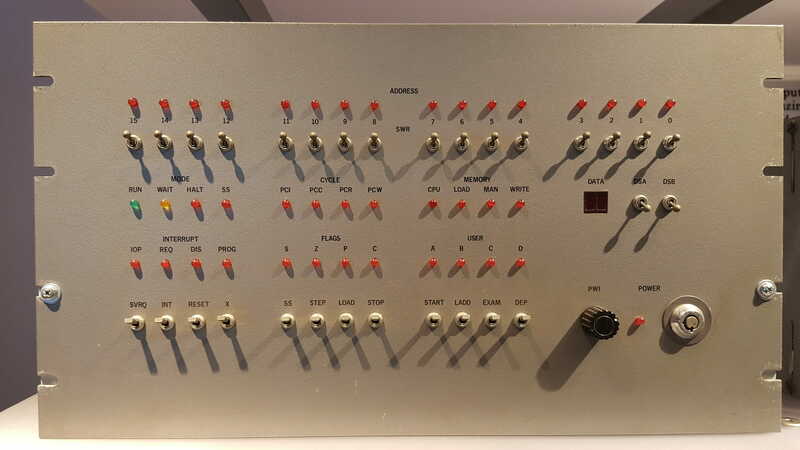 The front panel of my 8008 system (Oct, 1974) as seen in the Computer History Museum during a May, 2015 visit.